"We Turn Skeletons Into Goddesses"
Last summer it was the thigh-gap, and this summer some rude human being from 4chan trolled the forums with a new impossible #thinspo goal aimed at women's bodies: the bikini bridge. If you were just as uninformed as I was, a bikini bridge is the gap between your stomach and your bathing suit when you're lying down tanning. Whether this was a sick joke or not, it's horrible how fast this idea that a girl needed this "bikini bridge" spread. I've seen pictures with the text "summer isn't summer without a bikini bridge" and "when he sneaks a peek at your bikini bridge #justgirlythings" written over a very tan and thin girl tanning in various places. Scrolling through the endless Pinterest pages with pictures of these bikini bridges and thigh-gaps makes me upset. I've struggled enough trying to get past the thigh-gap "trend" from last year and now this sick joke-turned "trend" pops up and I feel like I have another thing on my plate. The truth of the matter is, I don't need a thigh-gap or a bikini bridge or a flat stomach. If I can look into the mirror and am truly happy with what I'm seeing, then why should I change it for somebody else? For the rest of the world? Think about that. The thinspiration pages on Pinterest and Tumblr are even more sickening. Look at your own discretion. They're filled with triggering images of seemingly impossibly thin girls and quotes that make your stomach churn from just reading them. God bless those two sites for attaching a warning when you search for 'thinspo' or 'thinspiration', explaining how eating disorders are mental disorders, not life choices, and that they can be serious and life-theatening if not treated. They also attach the number to the National Eating Disorder Hotline and the website for it as well. 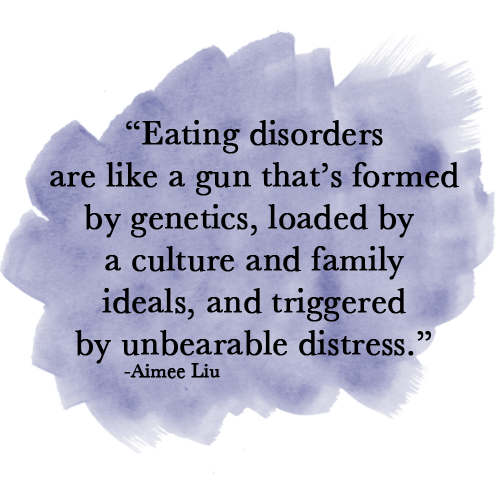 I've spent my fair share of time reading through countless forums and informational pages on eating disorders, specifically anorexia. For about two years, I compiled this information for a story that I was writing and for that amount of time, I grew especially sensitive to EDs and their triggers. I find it extremely disheartening (and occasionally triggering) when people make comments about their weight and how unhappy they are with it. They may just be making observations, but at some point in people's lives, those observations can turn into an obsession for themselves, or the person they might inadvertently be triggering. "I don't care if its [sic] wrong of me to say this or not, but I respect the f**k out of people with eating disorders. I could never not eat." I can't believe I actually have to say this, but it is NOT OKAY TO SAY ANYTHING OF THIS SORT. EVER. Glamorizing eating disorders is disgusting. People don't choose to one day have an eating disorder and get rid of it a few weeks later. An ED is a serious issue involving one's mental health and shouldn't be taken so lightly as to make a joke about it on social media. If you can stomach this video (I barely could), I recommend watching this Dr. Oz special on the 56-pound woman. Warning: extremely triggering. I definitely had to pause this video quite a few times and had my crying breaks. This is what you are making jokes about and are striving for. And that is so sad. In addition to this video, I found a post that has some heartbreaking quotes that also explain, through words, what having an eating disorder is like. Girls, especially young ones, are extremely impressionable. Starting a joke aimed at the bodies of women is incredibly hurtful and has already spread more insecurities like wildfire. Nobody wants to be told that they're not beautiful because they don't have the body that is widely desired. On the other hand, nobody has the right to declare one body type that has to be universally loved and adored. I've said this before, and I'm going to say this again: I don't care if you're tall and skinny, tall and heavy, short and skinny, short and heavy, or anything in between. I don't care, you should't care, and neither should anybody else in this world. What matters on the inside is what truly matters, and it makes me so sad to think that this is being forgotten more and more as the days pass.